Wrinkles are one of the more obvious and distressing signs of aging. The Sciton Profile’s MicroLaserPeel creates a face peel by removing the top layer of the epidermis, revealing younger, fresher, smoother skin underneath. 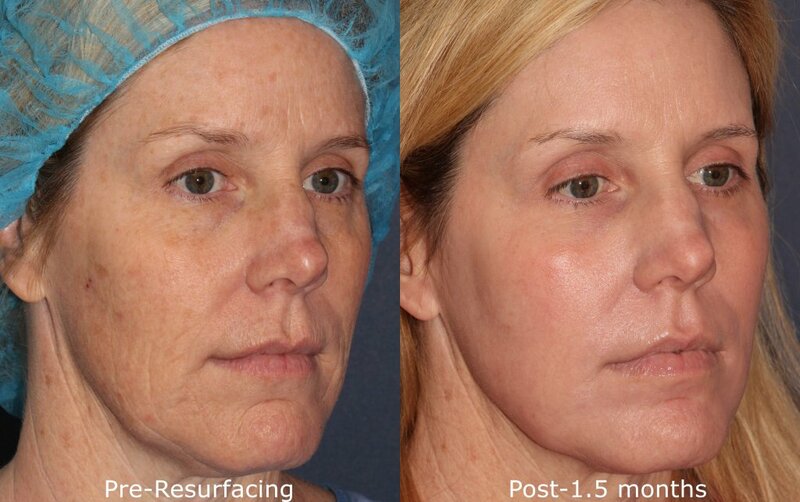 Patients are often astounded at how quickly their skin rejuvenates after laser dermatology treatments in Oceanside. Light therapy is a remarkable wrinkle treatment that can unveil a younger looking appearance in just days to weeks. Sciton Profile’s photorejuvenation laser treatments use broadband pulsed light to fade away solar lentigines (freckles or age spots), telangiectasias (spider veins), and rosacea – giving your complexion an even color and healthy glow. 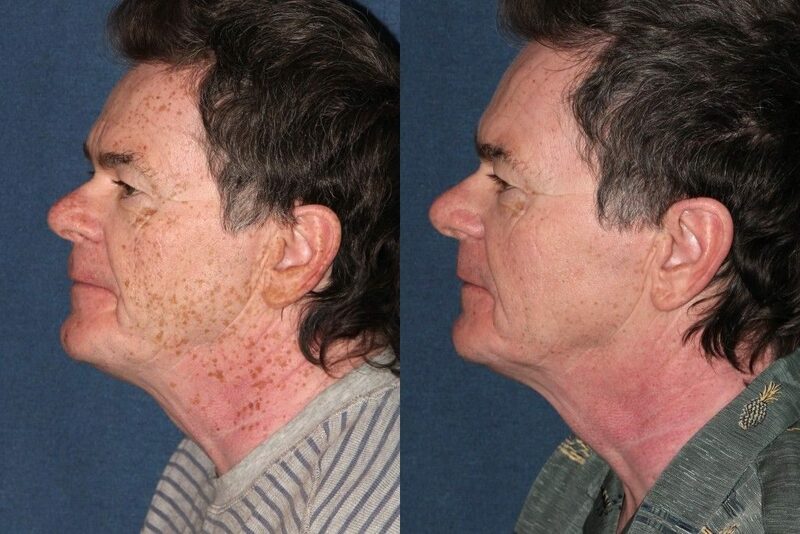 A series of laser treatments offers profound results. By going deeper into the dermis, Profile’s Profractional Therapy creates micro-wounds, which the body then heals by accelerating the production of collagen and elastin – two of the main building blocks of skin. This deep collagen remodeling sparks the skin to act younger and continue producing more collagen over time. The laser sagging skin treatment causes the epidermis to tighten and plump, creating a more youthful and healthful look. Whether you have port wine spots or hyperpigmentation due to aging, the Sciton Profile can get past the discoloration, allowing new, unmottled skin to grow in its place. The number of laser age spot treatments you need will depend on the size and depth of your lesions. Actinic keratosis refers to a patch of red, thick, scaly and/or crusty skin lesions that usually range from about 2mm to 6mm or more. These lesions are considered precancerous. Affecting mostly lighter-skinned people, actinic keratosis is caused by overexposure to ultraviolet rays of the sun and tanning beds. Left untreated, up to 10% of lesions will develop into squamous cell carcinoma. More rarely, they will develop into basal cell carcinoma. The Sciton Profile laser treatment can be used to remove actinic keratoses before they become cancerous. It can also remove moles, either for aesthetic or health reasons. Mole treatment is essential for moles that have begun to grow, bleed or otherwise change, as they may be transforming to melanoma – the deadliest form of skin cancer. Any sudden appearance of or change in a lesion, plaque or mole is worrisome and should be brought to the attention of your La Jolla dermatologist in order to receive timely Sciton laser mole treatment. sciton.com explains for about what the Sciton Profile laser can do. Most people will at one time or another develop acne, although it usually strikes in the teen years. Sciton laser treatment works by killing bacteria under the skin and shrinking sebaceous glands so that they produce less sebum. The reduction in sebum and bacteria lowers the chances that a follicle will clog and develop into a comedone or pimple. Often traditional forms of acne treatment, such as cleansers, are not as effective at cleaning the pores as laser treatment. 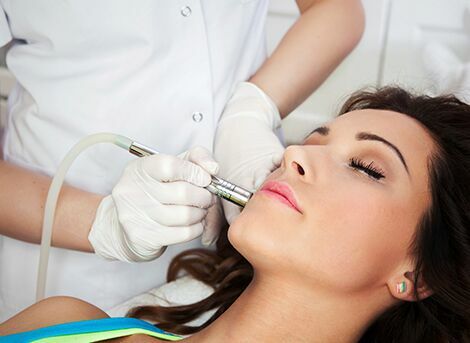 The Sciton laser treatment also stimulates the production of collagen, which repairs acne-ravaged skin, making it less susceptible to future lesions. The Sciton laser has the advantage of being able to effectively treat all skin types and tones – unlike CO2 lasers, which may be too harsh for sensitive epidermis or discolor darker skin. Light therapy is an effective form of acne treatment when topical ointments have failed. Whether they develop as a sequela of acne, or as the result of other trauma to the skin, sebaceous cysts are unsightly and painful. These noncancerous lesions arise when the sebaceous gland in a hair follicle becomes traumatized and fails to function properly, leading to a build-up of sebum and fluids and subsequent swelling. They can be found on the scalp, face, neck or back and may be several centimeters in diameter. The Sciton laser is a highly effective cyst treatment that can excise smaller sebaceous cysts quickly and easily. For larger cysts, surgery may be necessary, but the resulting scar can then be remodeled with a Sciton laser. The Sciton Laser’s flexibility means that we can design combination therapy that uses a variety of lasers to address all of your needs in one session. Healing typically takes between two and three days, depending on the depth of treatment you receive. Most patients will need between one and three laser sessions for effective acne or pigmentation treatment results. Many dermatology patients have more than one issue, and the Sciton Profile may be able to address them all – simultaneously. Those with aging skin will often opt for MicroLaserPeel as a wrinkle treatment and to even out skin tone and lesions plus profractional therapy to stimulate the production of collagen for skin rejuvenation. 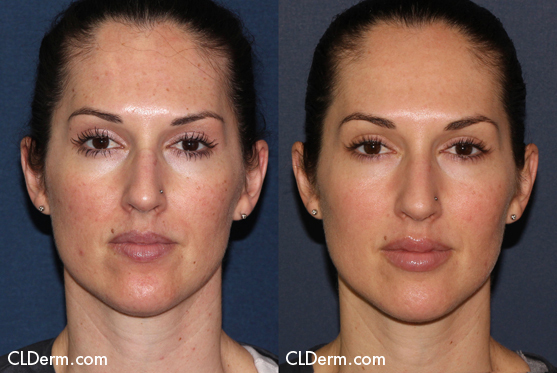 Using several lasers during the same procedure allows the dermatologist to resolve all of your issues at once, minimizing your downtime and discomfort, and speeding you toward the resolution you desire: clear, plump, healthy, youthful skin. 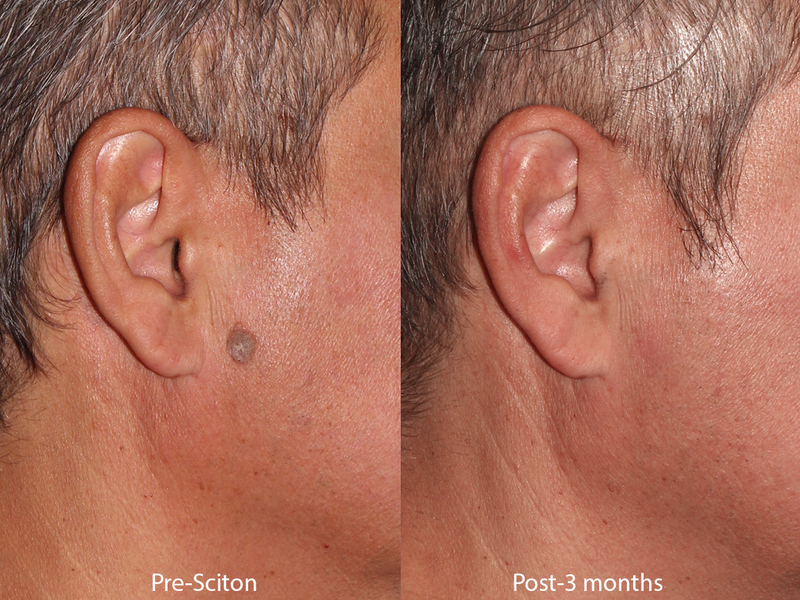 Dr. Wu used the Sciton laser to treat this long-standing disfiguring benign skin growth. 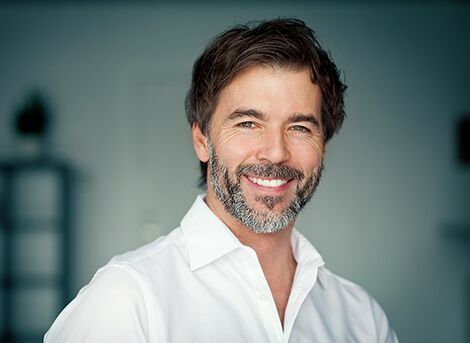 A consultation with one of our age-reversing specialists will give you an in-depth analysis of your skin’s issues and what types of laser therapies or anti-aging treatments like dermal fillers or microdermabrasion will help resolve them. Contact us today to learn more about the various skincare treatments offered at our center. 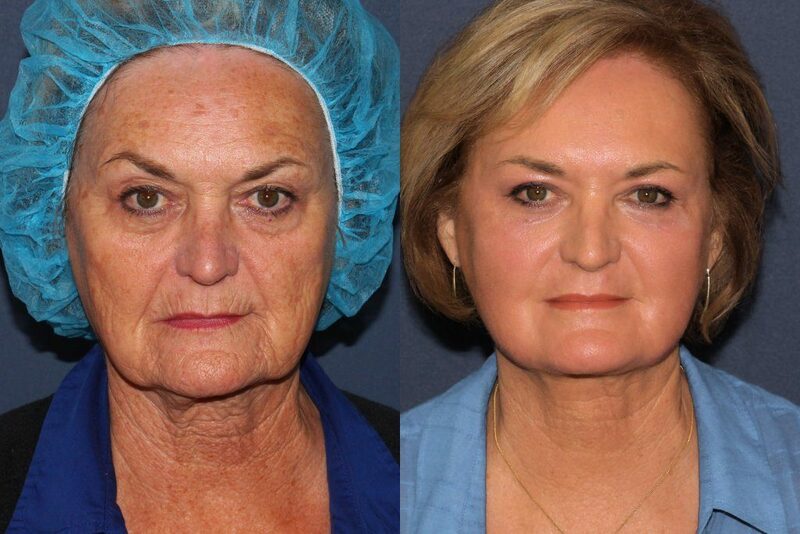 The age-reversing treatment you receive with us can help you stay healthy and look great for years to come.